Thanks for visiting! If you’d like to read more travel tips, kids’ activity ideas, and stories from life with our two girls, follow our blog on pinterest, subscribe by email, and/or join the conversation on the Nothing if Not Intentional facebook page! If you follow along on facebook (and if you don’t already, please do! 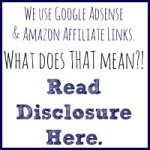 I’d love for you to join the conversation! ), then you may already know that the other day I totally overestimated my own abilities when I decided to take a newly-potty trained toddler and a nursing baby to the ZOO. BY MYSELF. No friends, no daddy, no baby carrier, and just one stroller. What was I thinking? In the end, it turned out okay. The only one who had a bit of a meltdown was yours truly. To keep the adult meltdowns to a minimum when you attempt the zoo with kids, let me help you learn from my mistakes. Check the map before you go. 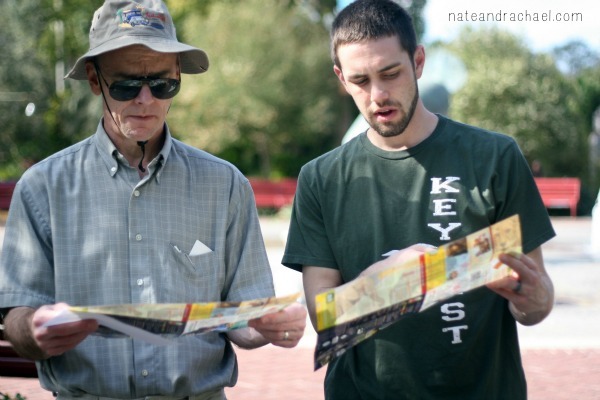 When we’re together, Nate’s the navigator. (It’s a natural role for a pilot.) I was totally unprepared to take on this role when I was alone with the girls. A lot of frustration would have been eliminated if I would have simply glanced over the online map ahead of time. Keep an eye on the time. I felt great (and ambitious) at the beginning of the morning, so I decided to tackle the entire zoo. The zoo we were visiting (the Mesker Park Zoo in Evansville, Indiana) is small enough that this isn’t totally unreasonable. But I lost track of time. As such, we were far, far, far away from the entrance when nap time hit. Side note: why don’t more zoos have an “express lane”? As in, a path that goes straight down the middle of the zoo? The animals wouldn’t mind, right? I had her ride on the footrest on her baby sister’s stroller. I heard a few, “She’s kicking me! I don’t want her to kick me!” But it was better than carrying her up the hills or having her struggle on foot! Had I planned better, I would have brought along our two lightweight strollers (these) and linked them together (using these). 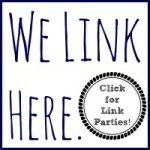 Speaking of links, I love toy links! When we travel, I often link them to the baby carrier so that the little one has access to her own toys. While we were at the zoo, I linked our water bottles to the stroller seat belt. That way the baby was able to reach her own water but NOT able to throw it out of the stroller and down the hill. Make your own souvenirs. I’m not an impulse buyer, but I’ll admit I longingly eyed the cute tiger and zebra memorabilia in the shop. Especially since my toddler was so excited by the striped zebras and giraffes with long necks on this trip! To help you resist the urge to overspend, check out this easy tutorial on how to make your own souvenirs using your digital pictures. Another obvious tip: bring water and weather protection. Hats, sunscreen, refillable water bottles. If you keep an umbrella in the car, throw it in the bottom of your stroller. You can use it if there’s a light sprinkle or blazing sun. If you forget water bottles, make sure you have change or small bills for vending machines. After I lost my water bottle (sigh), I was dying for a drink. But all I had was one twenty dollar bill! Not cool, Rachael, not cool. A lot of zoos don’t allow outside food. However, many will make exceptions for baby food (which is good since I’m a stickler when it comes to my girls’ food choices. Hot dogs from the snack shack wouldn’t cut it for my almost-one-year-old). I brought along squeezable applesauce pouches (like these) and animal crackers to help ward off meltdowns and hunger-induced tantrums. Prepare your kiddos ahead of time for what they’re going to see. With a little pre-trip prep, you can build zoo-related excitement even for babies and young toddlers. We LOVE watching the live animal cams you can find online. 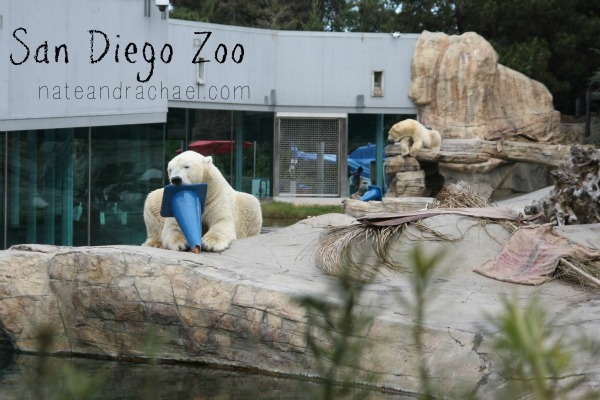 Some of our favorites are San Diego Zoo, Houston Zoo, and the Columbus Zoo. Of course, I consider animal books to be an essential part of the pre-trip preparation process. It was fun to help our baby connect the pictures she sees and the animal noises we make to the real animals at the zoo. “Oh, look! It’s a TIGER! There’s a TIGER in your book at home! What’s a tiger say? Rooooooooaaarrr!” If you’re really on top of things (i.e. Super Mom with extra arms and hands), you could even bring your favorite animal books with you to the zoo to point to and discuss as you visit the different animals. Tails–this one is a favorite of both our baby AND toddler. The bright colors draw you in, and the textures and movable flaps encourage interaction and engagement. Curious George Visits the Zoo–this is one of my personal favorites. Call me nostalgic, but I find Curious George endearing. Llama Llama. Why Llama Llama? Because you might actually get to see and/or PET a llama at the zoo! It’s fun for (my) kids to make the connection between the real animals and our favorite books. Thomas and the Hide and Seek Animals–my girls are pretty respectful and careful with lift the flap books, so I don’t hesitate to recommend this one. It’s simple, but it’s fun to connect Thomas, trains, and zoo animals. If I Ran the Zoo–what’s a children’s book list without a little Dr. Seuss? Polar Bear, Polar Bear, What Do You Hear? There are lots of Eric Carle books that include zoo animals. This is one that our daughter frequently asks to read. Edible Zoo Small World from Fantastic Fun and Learning. Build Your Own Zoo–Pretend Play from No Time for Flashcards. 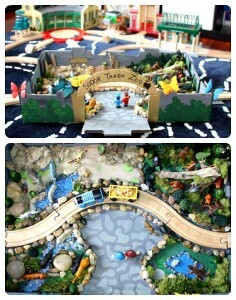 DIY Zoo Train Set from Play Trains! Montessori-Inspired Zoo Animal Unit from Living Montessori Now. Read 16 Zoo and Animal Books from KC EDventures. 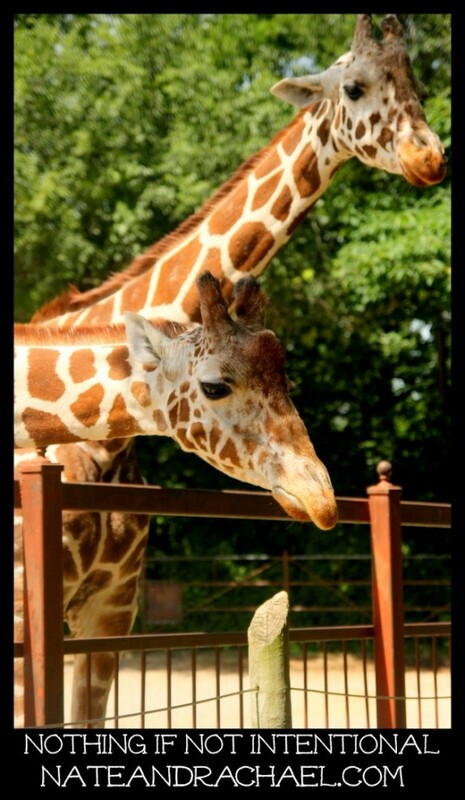 Printable Zoo Scavenger Hunt for your zoo trip from I Can Teach My Child! Make animal hand prints with Craftulate. 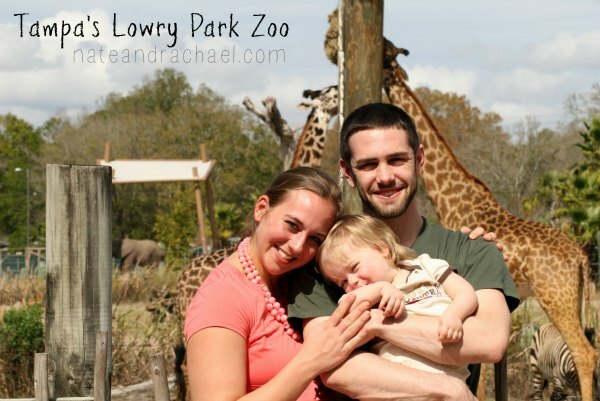 Such great tips for a zoo visit! Love the one about not being too cheap to take the tram/train – that advice is worth it’s weight in gold 🙂 Thanks for including our book list too. I totally think they should have an express lane. That makes so much sense. Those stroller linking things are amazing!!! I may have to order some tonight! I didn’t want to get a double stroller since they’re so expensive and bulky, and I didn’t know how often I’d use it, but this would solve all our problems!! Right?! They are AWESOME. Granted, it helps if the two strollers are identical. And some people complain that they’re hard to steer. But we keep them in our car with our strollers. Space and money saver, for sure! Wow – I have SO much respect for you even attempting this on your own! Well done! Great post with top tips. We have a buggy board for when our toddler gets tired and that saves us having to lug a double buggy around – perfect for little ones with a small age gap like mine (17 months).